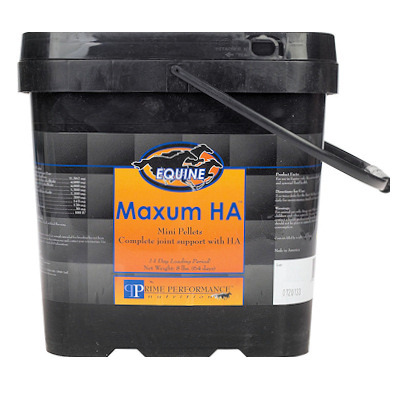 Maxum HA(PPN) is our Highest Potency Equine Joint Supplement with MSM, each 2 ounce daily serving provides: 4,000 mg Glucosamine HCL(shellfish), 4,000 mg Glucosamine Sulfate(shellfish), 11,562 mg MSM, 1,100 mg Chondroitin Sulfate(shark), 30 mg Hyaluronic Acid and 1,500 mg of Vitamin C in a Mini Pellet. A 2 ounce scoop is included. Feed Maxum HA at the rate of 2 ounces twice daily for 14 days, then feed 2 ounces once daily for maintenance.